The way of the world leaves us closed off from having access to God. The cares of this life steal every opportunity to having a close walk with God. So how do we have access to Him? Before Jesus left this earth He gave His disciple the answer. It would be by a spirit that strengthened Him through very trying times and even closer to His Father in heaven. He promised the holy spirit to be a comforter for all who repent and follow Him. A spirit that would teach us all things of God! (John 14:26-28). 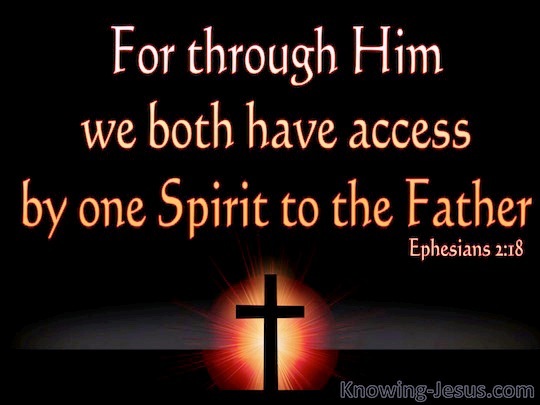 We have access to God by the eternal spirit that was before the world was created “And the earth was without form, and void; and darkness was upon the face of the deep. And the spirit of God moved upon the face of the waters”. (Genesis 1:2). Ephesians 2:18-2218 For through him we both have access by one Spirit unto the Father.19 Now therefore ye are no more strangers and foreigners, but fellow citizens with the saints, and of the household of God;20 And are built upon the foundation of the apostles and prophets, Jesus Christ himself being the chief corner stone;21 In whom all the building fitly framed together groweth unto an holy temple in the Lord:22 In whom ye also are builded together for an habitation of God through the Spirit.